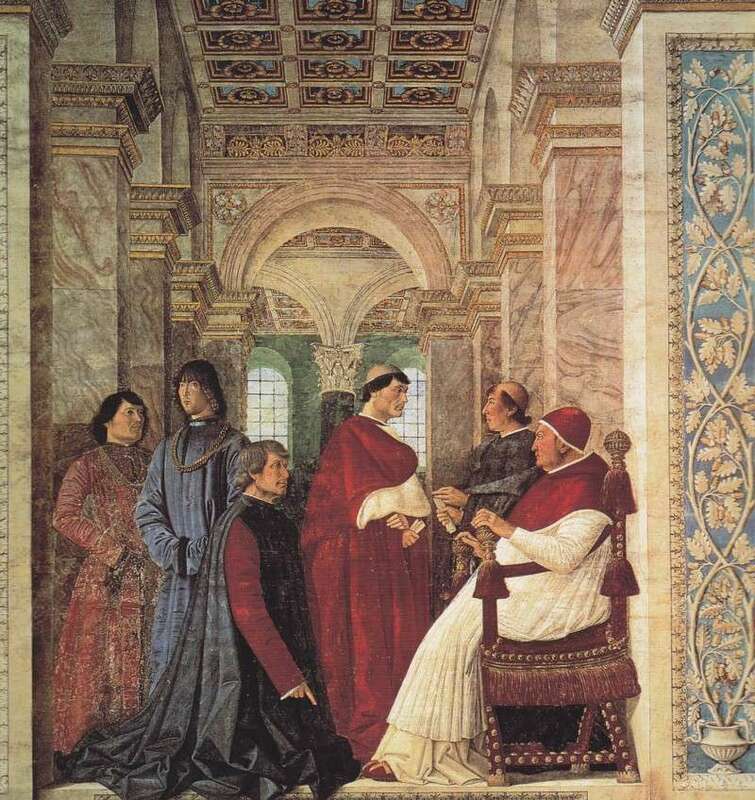 We have talked about Pope Julius II having Michelangelo paint the Sistine Chapel. His uncle, Pope Sixtus IV, actually built the Sistine Chapel, and it is named for him. And this is one of only two illuminated manuscripts in the Collection. It has gold writing on it and is very fancy, with a very colorful design that has his coat of arms. It is a ‘papal fiat’, that is, it is a ‘request’ to Pope Sixtus IV for something in particular. It’s quite rare, and when you look at it, it’s just a beautiful piece, a museum quality piece. 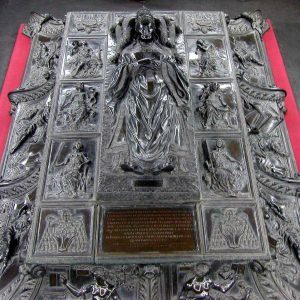 Another fact regarding this item is that in the case of Pope Julius II, he signed with a J, for his papal name and also for his baptismal name. 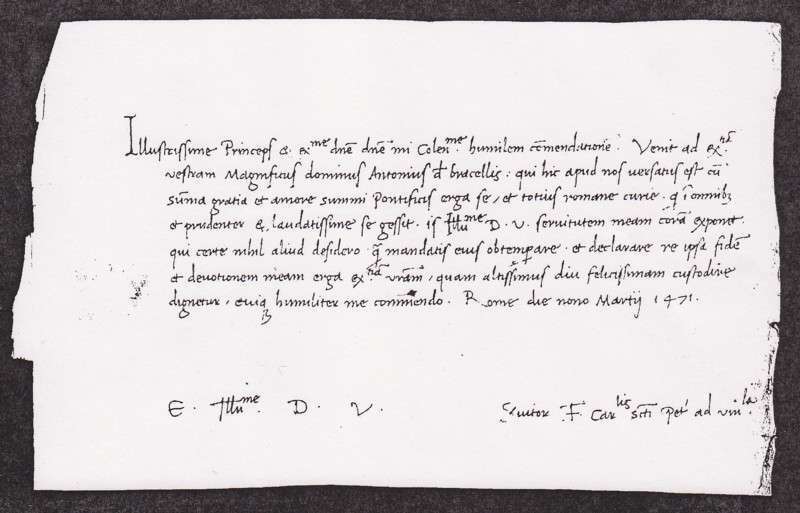 Pope Sixtus also signed in the same way: ‘F’, for Francesco, his baptismal name, because this was the common form of signature during his time, too. This was the first year of his pontificate. 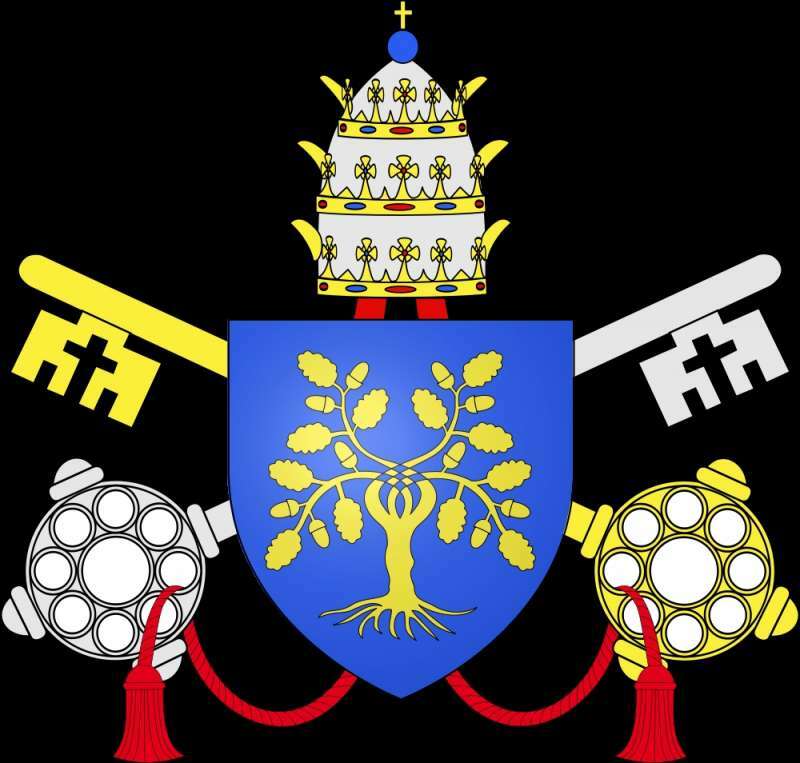 A Papal Fiat: a request either by a diocese, a bishop or a religious order, or some wealthy/powerful family, for permission from the pope. It has his coat of arms, the oak tree with the cross keys and the tiara. There is a lot of colorful painting and gold leaf on this parchment. It is vellum, that is, lambskin dating to the first year of his pontificate, 1471. The first part of the document is a large paragraph in a calligrapher’s hand. He signs, giving approval in light brown ink. Below that is a much smaller paragraph in the same calligrapher’s hand. He again signs it. These papal fiats are generally signed by the initial of their baptismal names, rather than their papal names. Therefore, this is signed with the letter F, for Francisco. 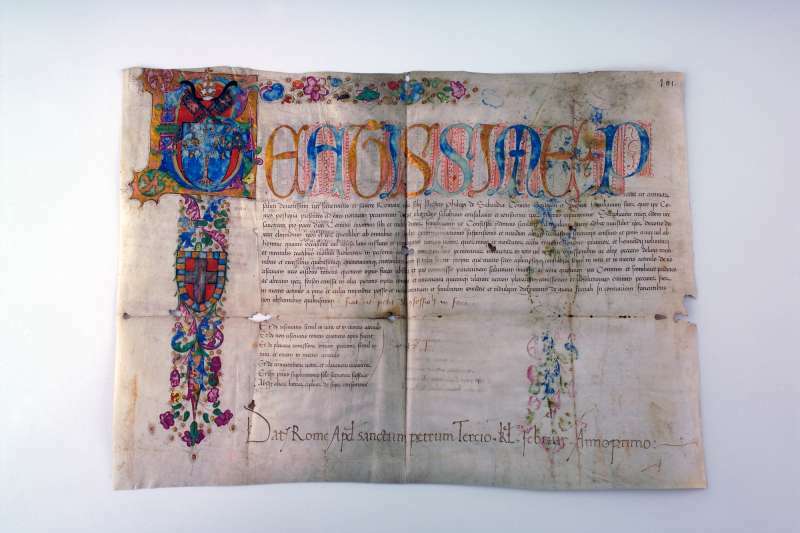 This is the finest looking document in the Collection because of its ornate beauty and quality of illumination making it rarer than the majority of the Collection. It’s a supplication, sent to the Pope, by Count Philip of Savoy (he became Duke in 1496), requesting the privilege of choosing a confessor for himself and his family of his own desire (rather than in accordance with Canon Law). 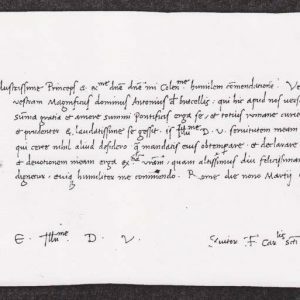 The supplication was granted (Fiat ut petit, de confessione in fora) as is noted by the signature of Pope Sixtus IV–the letter F for Francisco, his baptismal name. The last line, in another script is the official entry of the Datary’s office (Datum Romae apud Sanctum Petrum Tercio kl Februar. 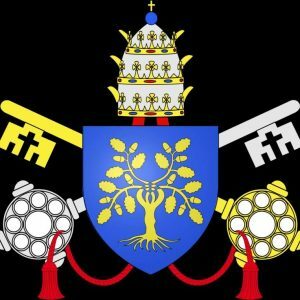 Anno Primo: 30 January); if it’s Sixtus IV, then that would be 1472. Papal Artifacts extends our gratitude to Professor John Adams for his “illumination” of this manuscript. Thank you, Professor Adams. This is one of two illuminated manuscripts in the collection. It has his coat of arms, the oak tree with the cross keys and the tiara. There is a lot of colorful painting and gold leaf on this parchment. It is vellum, that is, lambskin dating to the first year of his pontificate, 1471. By all respects, given his personal gifts, Sixtus IV should have emerged as one of our greatest popes. Within Rome itself, this truly Renaissance man created artistic achievements still enjoyed today. 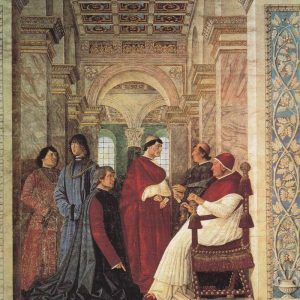 By the end of his papacy, the spiritual prestige of the papacy was left in shambles, leaving one to marvel at its ability to survive this immensely secular and often immoral chapter of church history. Despite his accomplishments in the realm of aesthetics and restoration in Rome, his papacy is considered a failure diplomatically, politically, militarily and spiritually. 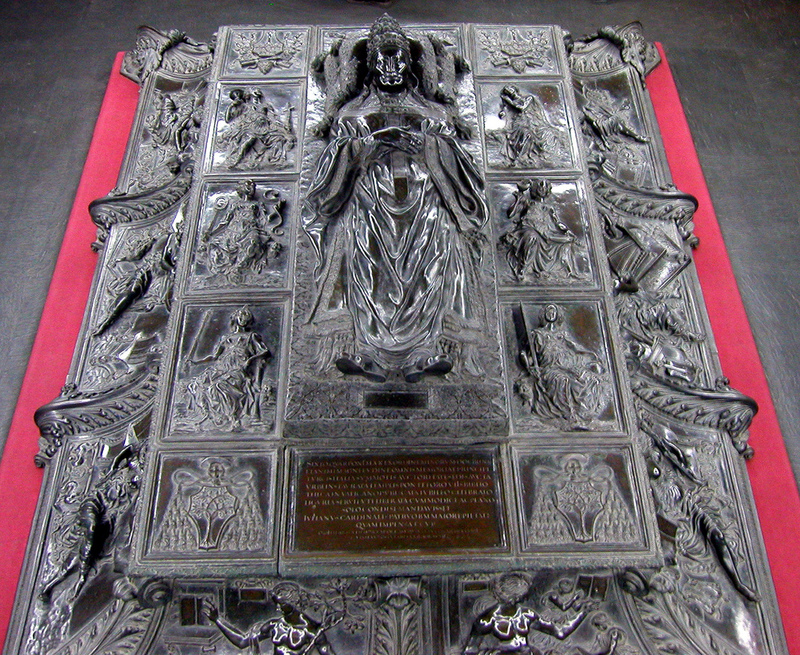 Pope Sixtus IV is buried, along with the remains of his nephew, Pope Julius II, in St. Peter’s Basilica in the floor in front of the monument to Pope Clement X. A simple marble tombstone marks the site, which is often covered with chairs.